What kinds of things did you have to focus on improving when Nicki first moved to Atlanta to start working with you? Debra Antney: Her self-esteem. She really went through a lot of stuff—trust factors and all those kinds of little things. The one thing she wanted to do was sing, so I placed her with Jan Smith to get some vocal training. I wanted to see where she was and actually allow her to feel comfortable with her vocals. And the result of all that was Beam Me Up Scotty? Yeah, it was the illest. Even though it was a mixtape, it opened up doors for her. That mixtape is incredible. Were there specific kinds of challenges you had to deal with working with a woman rapper? Nicki has made it hard for me to deal with other women. Her focus was phenomenal. That bar is raised so high because of what she did and her work ethic. There wasn’t no partying, there wasn’t no drugs, there wasn’t no guys, there wasn’t none of that. Wasn’t no mess, she wasn’t on a bunch of meds, she wasn’t into drama. She worked. Most girls, when they get into the game, they fight with their boyfriends. That’s it—no work. Even when she was trippin’, it was OK with me because by that time she had become a little spoiled. But I have nothing negative to say about working with her. The problem is that other females have it hard with me, now. They really go through hell because she raised the bar really high. So you expect more from people. I just remember that timid little girl. I put her through hell and made her stand up to every damn thing. There was no stepping down. There was no falling down. There was no nothing. We went at it. What did you have to stand up against? The people. The rumors. The biggest obstacle was that she was a female. She was becoming more known and right away people compared her to Lil’ Kim. I hated that. I hated that they put those two women up against each other. That was the hardest thing—coming through and her having to walk in the shoes of other people. She’s very harmless, she really was. She wasn’t disrespectful as far as that went. But at what point do they stop, so she can be her own person? How did you try to move beyond that? The one thing I wanted Nicki to do was push her music on her own. Not with a man. You can run with them, you can rock with them, you can do whatever, but they’re not going to put you out. You’re going put you out. You’re going to make these people love you for you, for who you are, and not because of the man you’re with. If you look through history and you really pay attention to how women came out, we all come out through a man. At the end of the day, if he die, you die. To get this far, she’s been the one chick in this rap game who stood on her own merit. What about her relationship with Lil Wayne? I don’t really know a lot. That’s not for me to discuss. One time I spoke to Baby and Slim, they didn’t even realize that she was how she was. That was phenomenal. I’m curious about female rappers in general too. What are some of the obstacles they face trying to break in and prove themselves? Not knowing who they are—that’s the biggest thing. The next thing is going in and people not capturing who they are and building from there. Nicki was dope for being who she was. There was nothing else placed in her to make her be somebody else. All the many characters she had inside of her were her. She was like my Barbie, my little Harajuku—she was all these different people. She was my Marilyn Monroe and my baby boo. All of the greatest women that you can think of—from the sexiest to whoever—she was all of those people rolled up in one. She was always going to be every women and she’s proven that. Have you noticed differences between the male rappers you’ve worked and the female rappers? Women are viewed differently because we cost more money, number one. A guy could look like Cyclopes’ twin and get up there and make it. He just throws on a T-shirt and some jeans and he’s fly. For us, it’s the whole glam squad—the hair, the makeup—all these things that you have to have. It costs more to build a female than a male. And then they cost more when they start PMSing and going through their little issues. They know everything, they have to have everything their way, and they’re not submissive. They don’t know how to be submissive. They can be confrontational and argumentative. That’s why I loved Nicki. Whatever I told her had to be done, even if she gave me fever, she knew exactly how to act. She didn’t wear it on her face or on her sleeve. She did what she had to do. I can compare her to a lot of females that I work with and by far none of them could stand in the same room as her. Real talk. To focus for a moment on what you we were saying about female rappers being more expensive. 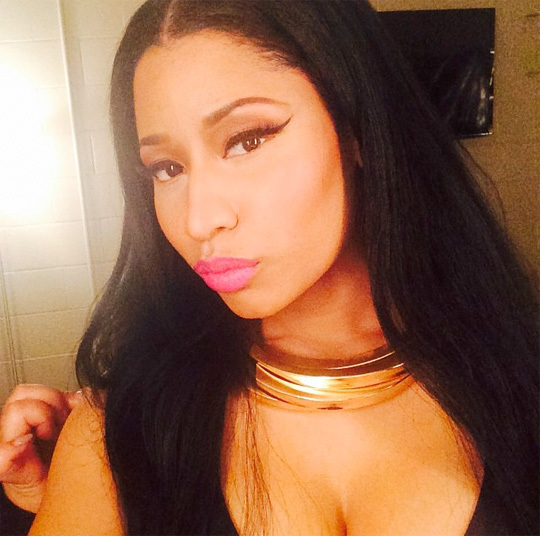 Have you noticed that labels are hesitant to sign female rappers because of that? Yeah, they cost too much. They have a female that wants to wear Versace who can’t even spell Versace. It’s better just being who they are. Nicki had her own look. She did what she wanted to do and she made it inexpensive until she could get to that point that she could get what she wanted when she wanted it. Before that, she made it inexpensive. The only thing we played with a lot was the shoes. I’m a shoe freak, which made her a shoe freak and her shoe game was impeccable. She didn’t have to have a thousand diamonds on to make her complete. She made costume jewelry look very expensive, but she liked the look. She liked the bangles. What do you think about the state of female rappers today? It’s territorial when really everybody’s their own individual and there’s enough for everybody to get out there. All the guys can collab together and work together. It’s pathetic. It actually makes me sick. How does that stunt a rapper’s growth? It’s ridiculous. If everybody could just learn to respect one another, we would be so much further and that’s why Nicki doesn’t have anybody who can knock her down yet. Because that’s what their focus is. Their focus is not coming in to be the next superstar. Their focus is knocking her down. They’re going fail because they don’t even think about what it takes. They’re just running after one freaking record and think they’ve got it going on. It took a lot to build Nicki Minaj. It wasn’t one record. What do you think of Iggy Azalea’s skyrocket to the top this summer? I love Iggy, but Iggy and Nicki are in two different categories. Iggy’s in her lane, but she’s not over here in this. They’re two different artists. I wonder what’s Iggy Azalea’s impact on the hip-hop scene as a white woman from Australia making semi-pop music. Nicki didn’t come out pop, so you can’t put the two together like that. People just have to stay in their lanes. I’m seeing people taking shots now. It’s almost like everyone wants it to happen. To pit them against each other? Yeah, I’m just hoping and praying that Nicki don’t feed into it and doesn’t go there because that’s their advertisement right there. That’s their selling point—her feeling threatened. Shots fired, but if you’re not hit by it, then why react to it? There’s no threat there at all. They place people in the urban market and then find the urban artist that they can pair them with. Even though they’re not really urban, they place them there and make it look like they are and people run with it. When you say “they” do you mean labels? Yeah, they say let’s find somebody that we can fit in and see if we can squeeze our way in there. I wouldn’t just look at Iggy. Iggy can rap, so that makes her hop over on to the urban side. I think Iggy’s got it, but she needs more training. She’s not ready to come up against Nicki Minaj. That’s not a good fighting match. I wouldn’t even pay to see that. They have to come at Nicki a lot stronger than Iggy Azalea. Iggy can come in and she can run her own lane and do her own thing, but she’s not strong enough for Nicki.